Holy Family Catholic School is identifiably Catholic in our culture and community spirit. Academic attitudes and instructional programs are built on this strong foundation of Christian principles. 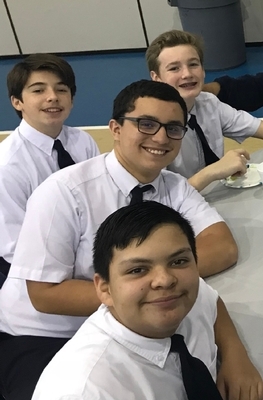 Our primary goal for our students is the development of the total person through programs which nurture spiritual, intellectual, emotional, social, and physical growth. Our motto of "Learn, Serve, and Lead" exemplifies three traits our students focus on throughout their education. As future leaders, they must first learn their faith by serving as Jesus did. Furthermore, this motto extends to their academic and fine arts classes, as we encourage our scholars to learn with an open and Christian mind.